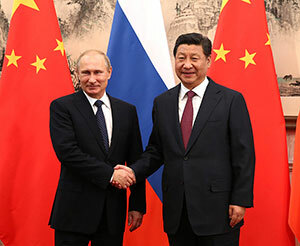 Presidents Vladimir Putin and Xi Jinping in Beijing, November 9, 2014. China and Russia can forge an ideological bloc based on shared resentment of the U.S.-led international order, but they cannot be true allies. Their competing interests are too important. The resolution of Sino-Russian border disputes in the 1990s did not lead to a revision of Chinese textbooks, which continue to teach that Russia stole 1.5 million square kilometers of China’s territory, and some of the border agreements have a limited duration. The disparity in population density across the border between packed Chinese Manchuria and the relatively empty, resource-rich Russian Far East is the greatest such disparity in the world. According to Alexei Arbatov, Chinese analysts now refer to Russia as China’s “resource rear”—a label that does not exactly connote respect for Russian sovereignty. The unrest that Russia has fomented in Ukraine has disrupted Chinese agro-investments there. Official Chinese maps of its Silk Road project through Central Asia to the Middle East and Europe omit the most obvious route—via the trans-Siberian railroad—thus cutting Russia out of China’s plans to economically integrate the Eurasian landmass. China and Russia would also seem to have conflicting interests in the Middle East, from which China needs stable, affordable oil and gas, while Russia is okay with instability and high prices. Further north, where Moscow has sought to establish its preeminence among the rival claimants that border the Arctic, Beijing asserts that, as a country with nearly one-fifth the world’s population, China is entitled to one-fifth of the global commons around the North Pole. Finally, China has reverse-engineered the weapons that it has bought from Russia, declining to re-up as a customer. Worse still, it now produces cheap copies for export, luring away other buyers of Russian wares. In recognition of these dynamics, Russia—until recently, at least—has declined to transfer some of its most important defense capabilities to China. And while engaging with the Chinese People's Liberation Army in both multilateral and bilateral exercises, the Russian military has also continued to hold its own exercises aimed at countering a potential Chinese challenge. China, meantime, respects Russia’s historical potency, but the experts in Beijing who calculate relative power today describe the country as in decline. Still, the Chinese strategic tradition counsels care in handling such a formidable potential rival on China’s flank, and the lesson of Cold War “Triangular Diplomacy” is to avoid being the isolated vertex in the triangle. As Beijing adopts policies that challenge U.S. interests in the Asia Pacific, it seeks to keep Russia on its side. China has extended critical financial support to Russia in the wake of the Ukraine-related sanctions. But one wonders what Beijing has asked for, and received, in return. China’s tough bargaining on energy deals reduced Russian profit margins, and energy is now cheap anyway. Has Russia offered up its best aircraft, air defense systems, or undersea capabilities in exchange for Chinese cash? If so, Putin has made a short-term accommodation that could come back to haunt Russia in the medium to long term. It’s absurd to say that China and Russia are forging a new ideological bloc. The term “ideology” is misleading. What does it mean? No country in the world likes outside interference in its internal affairs. This has nothing to do with ideology. No interference in the internal affairs of any country is a principle prescribed by international law. No alliance with any country—this is one of the cardinal principles of China’s foreign policy. We believe military alliance is a product of the Cold War. With the end of the Cold War, alliance has become obsolete. We used to have military alliance with the former Soviet Union. It was an unpleasant experience. In 1978, China adopted a new policy orientation, what we call reform and opening up to the outside world. Since then, China has entered a new period of growth. Foreign policy is the extension of domestic policy. In line with our domestic policy which focuses on economic growth, we have designed a peaceful development strategy in our foreign policy. What does peaceful development strategy mean? It means three “nos" and three “yeses”. The first “no” is no expansion. China will never follow the footsteps of the former colonial powers. The second is no hegemony. China will never follow the footsteps of the former Soviet Union. The third is no alliance. China will never enter into military alliance with any country. What about the three “yeses”. The first is “yes” to peace. We are engaged in a huge undertaking to modernize China. Peace is the condition sine qua non for development. The second is “yes” to development. China is confronted with many problems. We believe that only development can provide a solution. The third is “yes” to cooperation. We are aware that in a globalized world, no country can modernize itself in isolation. International cooperation is indispensable. Thanks to international cooperation in the past 36 years, China’s economic growth proves to be a success story. President Xi Jinping has stated over and over again that China will stick to peaceful development strategy. We have no reasons whatever to deviate from this strategy. It’s true that in the past few years, cooperation between China and Russia is growing on the basis of mutual benefit. The Chinese and Russian economies are highly complementary to each other. China is a resource-poor country, while Russia is a resource-rich country. We need each other. Last year, the bilateral trade volume between China and Russia amounted to $95 billion. This represents about 2% of China’s foreign trade. There is large room for further development. We’re ready to develop cooperation with any country on the basis of equality and mutual benefit. The growth of China-U.S. relationship is a case in point. Last year, China-U.S. trade volume amounted to $540 billion. On the Ukrainian crisis, it’s the consistent position of China to call for the respect of the sovereignty and territorial integrity of any country in the world. We believe that the Ukrainian crisis cannot be solved by military means. We urge the parties concerned to seek a solution through diplomatic channels. Ambassador Wu's reference to the absurdity of an "ideological bloc" is interesting, and in the sense of “ideology” as sometimes used in policy circles the prospect does seem absurd. But there has been some convergence of strategic conceptualization between the sequence of governments based in Beijing and in Moscow since at least 1689, when they began their own history of diplomatic exchange, and since that time they have successfully negotiated the maintenance of their nearly 3,000 miles of shared borders. It has not been simple or uniformly peaceful, and the idea that two enormous countries sharing centuries of successfully resolved tensions between their ancestral empires without emerging with some common ideas about trade regulation and taxation, environmental management, migration controls and maintenance of security is not entirely credible. Those could amount to an ideology of a positive sort, as contrasted to mere suspicion of and opposition to the United States, a sort of negative ideology. There are clearly grounds for alliance between Russia and China based on stable shared perspectives and interests rather than only a shared opponent. The question of China’s dense population accumulation on one side of the border and Russia’s expanses of lightly inhabited and under-developed territory on the other presents as many possibilities for cooperation as for conflict. The same is true for the faltering of the regime in North Korea, the problems of resource exploitation and transport in Central Asia, the management of sea and air dominance of the western Pacific, the development of programs for exploitation of space and the moon, and financial and commercial initiatives in Europe, among other issues. Russia and China have every reason to explore mutually-disciplined expansion on all fronts at the expense, if possible, of the United States and Japan, and history suggests that the rewards are great enough that both parties will have reason to accept such a program. The possibility of disenchantment on either side will always be present. Each can cite grievances against the other if needed, from the First United Front to the Korean War to the Sino-Soviet split to border disputes. The greatest danger may come not from the complexities of their roles in the wider world but from the relative stabilities of their governments. Slippage by either would raise the question of support from the other, or exploitation of a crisis to in order to sponsor a new and perhaps dependent —or at least obliged— new regime. Their pasts, in other words, look a bit more solid than their futures. Where they seek friendship they could find betrayal. But their history suggests that whether empires or republics they have an underlying understanding of what it is to be expansive on the Asian continent, to be enemies of Japan, and to live in tension with whatever they mean by “the West.” Why they would need “ideology” to further consolidate their affinity is not clear, but realization of what they have in common could be an ideology in itself. —dates back to 1953, one could forgive Western observers for wondering whether it was a recent Global Times headline. Not long after Russia began to cripple non-government organizations (NGOs) with foreign patrons or partners, China did much the same. Beijing and Moscow are holding increasingly regular joint naval exercises, and participating in multilateral anti-terrorism exercises as part of the Shanghai Cooperation Organization. According to Russian Defense Minister Sergei Shoigu, U.S. attempts to strengthen its military and political clout in the Asia-Pacific Region are driving China and Russia to collaborate on shaping a collective regional security system. However, as Council on Foreign Relations expert and ChinaFile contributor Elizabeth Economy has pointed out, beneath the surface, there is competition between the two authoritarian giants…and a historical lack of trust among many within the broader citizenry of each country. Enhanced cooperation does not represent the reemergence of a new Sino-Russian ideological bloc. Both states are ultimately driven by their own self-interest and have different attitudes toward integration with the existing global order, especially the Western-led economic system. They will cooperate when their interests align, but are unlikely to seek accommodation when their interests diverge. For example, while Beijing and Moscow both take a hard stance against perceived foreign interference into their own internal affairs, it does not necessarily mean that each state will publicly defend the other's treatment of minorities or policies toward disputed territories. Russia is an increasingly revisionist power, while China tends to seek a stable world order. China's attitudes toward the conflicts in South Ossetia, Abkhazia, and Crimea provide strong insight into the limits of Chinese support for Russia. In each case, the P.R.C. Foreign Ministry acknowledged the history that led to the outbreak of hostilities, but nevertheless urged all actors to find a diplomatic solution that would respect the rights of all parties involved. Some Western observers appear perplexed by Beijing's reluctance to speak out more forcefully in support of Moscow's political and military agenda. Yet, among the key factors driving Chinese decision-making is a high-level concern over the implications of taking sides in inter-ethnic conflicts or endorsing the right of popular self-determination. What if China had supported the Russian-backed Crimean referendum on secession from Ukraine? What if China, like Russia, had diplomatically recognized the ethnic Abkhazian people's declaration of independence from Georgia? Would the Tibetans, Uyghurs, or Taiwanese demand equal treatment? Chinese rhetoric may have appeared ambiguous abroad, but the message was articulated far more clearly to audiences in the P.R.C. and Taiwan. Lest any potential splittists come to the wrong conclusions, retired People’s Liberation Army Major General and former military attache to Russia Wang Haiyun attempted to set the record straight . Crimea wasn’t engaging in a separatist act, but rather returning to the Russian motherland. He further explains that Tibet, Xinjiang, and Taiwan are children of the [Chinese] motherland. As they have “always been an inseparable part of Chinese territory,” they can not possibly be torn from their mother's embrace through secessionist acts. Broader and deeper Sino-Russian cooperation is thus not a forgone conclusion. Leaders in each nation will continue to consider their own strategic concerns and ultimately act according to their own national interests. While China and Russia may never be true allies for the reasons articulated by my colleagues above, they do appear increasingly willing to partner on areas of mutual interest as a means of exerting geopolitical pressure against the United States. This is especially true with respect to one area unaddressed in our conversation thus far: cybersecurity and Internet governance, where Presidents Putin and Xi have jointly resisted what they perceive to be U.S.-led Western interference in their internal affairs and core interests. China and Russia have embraced a common language of “cyber sovereignty” that they are not just enforcing within their own borders, but rather projecting into the international system in order to assemble an anti-U.S. coalition, shape global public opinion, and benefit economically by limiting business opportunities for American IT companies abroad. This common language of cyber sovereignty has four key elements. The first is the notion that state sovereignty is not just physical but also virtual—it extends to an inherent right of nations to control the flow of information to and from their citizens via the Internet. This stands in stark contrast to America’s position on Internet freedom. Shared negative reactions to the Arab Spring revolutions have accelerated Chinese-Russian cooperation in this regard. Both China and Russia have ramped up measures to restrict Internet activity in the name of national security and the rule of law. Second, China and Russia are working to proactively advance cyber sovereignty as an international norm by undermining American leadership and credibility in cyberspace. Here, the Edward Snowden revelations are used to criticize the United States for violating sovereignty worldwide, and to blunt American criticism of Chinese cyberespionage and Russian cybercrime . Following the U.S. indictment of five Chinese PLA officers for cyberespionage last May, China moved to cancel the Cyber Working Group of the U.S.-China Strategic and Economic Dialogue, and these talks have not resumed. Similarly, the U.S.-Russia bilateral cybesecurity dialogue is also now suspended amidst accusations that Russia is engaged in cyberattacks against Ukrainian, American, and NATO targets. Third, China and Russia are seeking to advance the concept of cyber sovereignty in the United Nations, challenging America’s preferred “multi-stakeholder” approach to Internet governance that also includes the private sector and civil society. The Shanghai Cooperation Organization recently submitted a revised draft International Code of Conduct for Information Security to the U.N. Secretary General, which asserts that “all states must play the same role in, and carry equal responsibility for, international governance of the Internet.” This move follows multiple efforts by Presidents Xi and Putin to assert cyber sovereignty as the basis for global Internet governance. Fourth, China is utilizing cyber sovereignty to accelerate an ambitious “Server Sinification” campaign, in which the Snowden disclosures are used as the pretext for import substitution, pushing American companies out of China’s IT sector. Russia has followed suit by granting huge IT contracts to China’s Huawei Telecommunications Co., as President Putin seeks relief from U.S. and E.U. sanctions. The cybersecurity example illustrates how Beijing-Moscow cooperation has reached increasing levels of sophistication. This is by no means an indication of an enduring alliance, nor does it appear to be driven by a deeply shared political, economic, or moral philosophy. But the United States should not underestimate the ability of China and Russia to craft a common language of resistance to Western influence that resonates in at least segments of the international system for many years to come. Relations between China and Russia operate on multiple levels. Globally, Beijing and Moscow are united in a push to move beyond the U.S.-dominated liberal order. Within their shared region, though, Russia and China frequently are at odds, two large, ambitious powers looking out for their own interests. Which of these dynamics—globally focused cooperation or regionally focused competition—ultimately wins out will depend to no small degree on how Washington handles relations with these two difficult partners. Sino-Russian cooperation has become increasingly visible in recent years. Such cooperation includes growing trade and investment ties, frequent summits between Vladimir Putin and Xi Jinping, renewed arms sales, and a $400 billion energy deal signed in May 2014 (which recently appears to have encountered some problems). Beijing also has been, if not supportive, at least understanding of Russia’s military intervention in Ukraine, which some Chinese analysts view as a template for how Beijing may choose to deal with disputes in its own neighborhood in the future. China and Russia also cooperate at the United Nations, where they share a commitment to state sovereignty and an aversion to U.S. military intervention, and in the Shanghai Cooperation Organization (S.C.O. ), a Eurasian bloc promoting illiberal values. Driving much of this cooperation is a shared discomfort with the dominant role of the United States and a liberal international order in which both Russia and China feel peripheral. If consummated, the Sino-Russian energy deal would allow Beijing to insulate itself from energy and financial sanctions imposed by the U.S., while Russian arms sales strengthen China’s hand in any potential conflict in the Taiwan Strait. At the same time, cooperation in the U.N. and the S.C.O. provides an alternative to U.S.-dominated liberal institutions. Look closer though and the Sino-Russian “comprehensive strategic partnership” is less secure. China and Russia are in open competition in much of their shared neighborhood. In Central Asia, China’s economic power is pushing out Russia. Moscow’s new Eurasian Economic Union is in part an effort to limit Central Asia’s reorientation towards China. Similarly, Moscow is seeking to expand the reach of its defense industry, and its prime customers are states like India and Vietnam that nurse territorial disputes with China. Many Russians also see a rising China as a potential threat to the Russian Far East (much of which was Chinese until the 19th century), and Russia’s military has even practiced repelling a Chinese invasion.